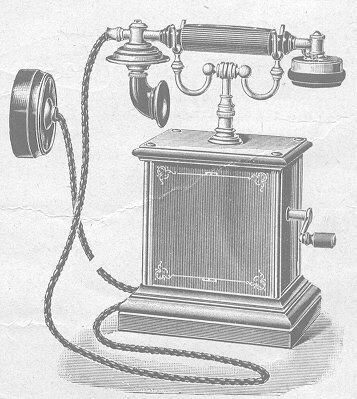 Comprising a Hand Microtelephone with “Manchester” Shot Carbon Transmitter, Double-pole “ Ring” Receiver and Four-conductor Green Flexible Cord, Automatic Nickel-plated Cradle Switch with Gold-Silver Alloy Contacts, Polarized Call Bell, wound to 1,000 ohms resistance and adjusted to ring through a line resistance of 25,000 ohms, Four-magnet Generator with Laminated Swedish Iron Armature, wound to 500 ohms resistance and fitted with a Spring-cushioned Pinion to facilitate quiet running. Armature and Pole Plates heavily Copper-plated to prevent rusting. Induction Coil, thoroughly Shellac varnished to prevent the entrance of moisture. Enamelled Metal Case with Nickel-plated Angle Pillars, and Polished Teak Base and Top. Fitted with a Four-conductor Green Flexible Connecting Cord, and Wall Rosette with Terminals and Lightning. Protector of plate type, enclosed under an Enamelled Metal Cover with Spring Catch. 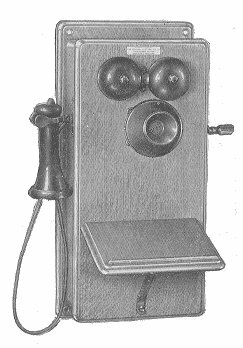 This Instrument has been specially designed for long distance ringing	and speaking. Wall pattern Magneto telephone with three magnet generator, double pole receiver, solid back transmitter and polarised bell wound to 1000 ohms. Battery compartment accommodates 2 dry cells.